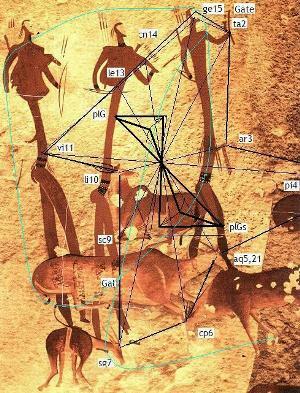 Prof Emmanuel Anati (2004) had noted a combination of innate compulsion, and communicative development in rock art, linked to economic complexity levels. However he also noted that some stylistic elements seemed cyclic. • Identification of common environmental, historic, and cosmic components. • Art and other media reveal subconscious cognition. Conscious processes are of minor importance to most cultural media, such as art, myth, ritual, and architecture, since artists could explain only their own conscious rationalisations, of visible themes, and of styling. There is only one art, and one culture, and we did not invent, design, or develop it. Culture, its media, and its artefacts, are shaped by the natural order of things that precede things. We re-express that order in our works, and thus transform materials into artefacts, as well as into universal structure. Culture is a natural given, just as the periodic table, chemistry, DNA, technology, ecology, and economy manifest themselves, and mutate to their own dictates, and maturity cycles, and interactions with other, equally structured media (what Gunderson labels ‘panarchical discourse’). Conscious thought and free will are overrated, while our subconscious minds and behaviour are underrated in the cultural record…………. [order the book Stoneprint at $30 plus postage from Four Equataors Media, via edmondfurter at gmail dot com using Paypal ]……….